Working with Mikhail Baryshnikov and White Oak, the innovative company that he had created, was an experience like none other. 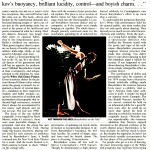 The greatest male dancer in the world, a dancer who could perform any style of dance he chose, watching him rehearse close up was perhaps one of the greatest experiences and privileges in my life. The blinding intensity of his focus and the purity of his concentration as he worked was a lesson in the profound humility mandatory for greatness. He is a romantic, a cynic, a master actor and a clown, a razor-sharp mimic and mime, and a modest showoff, startlingly sensitive to all things around him. I remember the wintery morning we were at his house for a CBS Sunday Morning shoot, and we spotted a small black bird on the ground, haplessly flapping his wings, struggling to fly. Misha jumped off the porch, gathered the small bird in his hands, and gently hid him from any animals who might consider him prey. 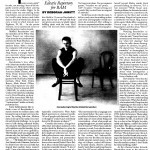 That same morning, he also spent part of his own interview trying to convince Jim McLaughlin, the producer, that he should do a piece on Merce Cunningham. Jim laughed and pointed at me: “Ellen has tried and tried. It’s probably the longest pitch I’ve ever encountered.” Unfazed, Misha continued his own pitch. Misha, of course, is such a media magnet, so the work of a publicist becomes also one of protecting his precious time. Say the name Trisha Brown to Mikhail “Misha” Baryshnikov, and his face breaks into a smile. 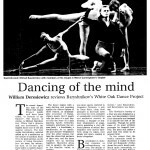 In the summer of 1998, Baryshnikov’s “White Oak” Project was scheduled to perform at the New Victory Theater, and I wanted to do something with the publicity effort that even he might enjoy. Two things I know about Misha: His love of speaking with journalists is not great, while his love of artists is boundless. 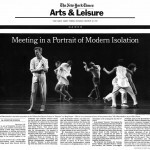 Light bulb moment: What if Trisha Brown, the doyenne of downtown dance, interviewed him, the prince of ballet, for The New York Times Arts & Leisure to run the Sunday of “White Oak’s” opening? 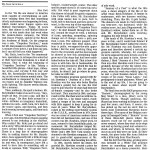 How could such a piece be anything but smart, witty, and give new insight into each of the artists? The resulting Q & A interview was fascinating, and stretched across the top of the fold on the front page that featured a fabulous photo of the duo, with a jump to a full page inside.